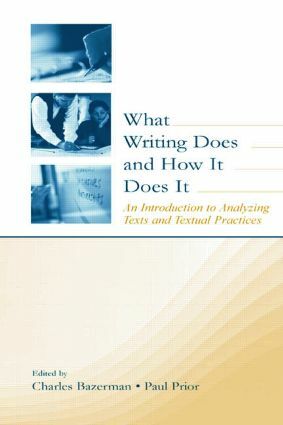 "What Writing Does and How It Does It provides a satisfactory beginning for advanced students of writing and researchers in any field that uses texts. The book and its individual chapters is a good example of the kind of "bootstrapping operation" that any teacher or researcher might employ in order to assist their students or themselves to move beyond a "naturalized" outlook and revise their understanding of their own work as well as others". "…the book is unique in its grounding in North American Writing Studies and in that the chapters offer doable and practical research procedures for the teacher/researcher. The book will be a valuable resource for graduate students and teachers of writing interested in learning about how to use discourse analysis as a research and teaching tool." Contents: C. Bazerman, P. Prior, Introduction. Part I:Analyzing Texts. T. Huckin, Content Analysis: What Texts Talk About. P. Eubanks, Poetics and Narrativity: How Texts Tell Stories. E. Barton, Linguistic Discourse Analysis: How the Language in Texts Works. C. Bazerman, Intertextuality: How Texts Rely on Other Texts. M.Z. Buell, Code-Switching and Second Language Writing: How Multiple Codes Are Combined in a Text. A.F. Wysocki, The Multiple Media of Texts: How Onscreen and Paper Texts Incorporate Words, Images, and Other Media. Part II:Analyzing Textual Practices. P. Prior, Tracing Process: How Texts Come Into Being. K. Leander, P. Prior, Speaking and Writing: How Talk and Text Interact in Situated Practices. G. Kamberelis, L. de la Luna, Children's Writing: How Textual Forms, Contextual Forces, and Textual Politics Co-Emerge. J. Selzer, Rhetorical Analysis: Understanding How Texts Persuade Readers. C. Bazerman, Speech Acts, Genres, and Activity Systems: How Texts Organize Activity and People.